We specialize in custom closets, especially custom walk in closets Manhattan NY where all apartments are nonstandard and require smart and personalized approach for designing and functionality. The basic rule here is to be usable, well -organized, user friendly and made of good natural eco materials: plywood, wood or MDF. We use only good quality lacquer, healthy paint and good materials. Each piece we create is masterfully designed and rich in detail. All of our millwork is made locally in our facility in Ridgewood, NY using the finest materials. Please find below our finished walk-in closets. OUR CARPENTERS DO BOTH WALK IN CLOSETS INTERIORS and EXTERIORS. They are truly custom made to fit your situation: Carpenters build whole new closets to just changing doors or redoing the interiors. Your project is based on your individual closet size and material needs. We do not carry out your closet project with items in standard sizes like many chain closet suppliers do. 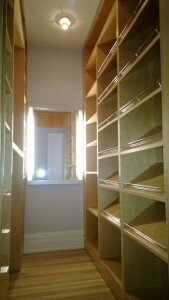 Our Carpenters make your custom closets to fit your particular space at competitive prices. MANY STYLES AND SIZES OF DOORS IN BI-FOLD, SLIDING, HINGED AND PIVOTING IN WOOD OR MIRRORED DOORS. Starting from walk in closet, its corps were built out of pre-finished maple on the inside and rift white oak on the outside. The closet was equipped with shoe shelves sloped at a special angle, a couple of brushed stainless steel coat rack bars and few soft closing drawers. We had an opportunity to design and produce the full walk-in closet for one apartment on Manhattan New York. 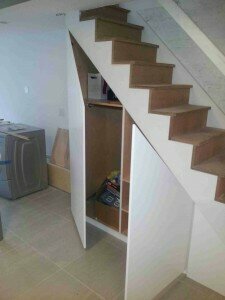 The sloped closet was build under the stairs to fulfill free space and add additional storage for our client. The final result was very impressive. The satisfaction was on both sides – our client’s and ours . We’ll create your custom walk in closet in NYC New York City Manhattan and Brooklyn NY in.